Each consists of short, easy-to-read high interest books in both print and software formats. The softbound printed books provide dozens of well written, colorful, and heavily illustrated stories. The software contains the same stories as the printed books and adds many interactive features. Stories are read aloud by professional narrators as text is highlighted, plus students can click on any word for identification. End-of-story questions encourage student comprehension. An easy-to-use management system lets you establish as many student logins as you like! You can then assign stories, track results, select narration style, and activate auto read. Learning to Get Along is a social skills and positive behavior program for students grades K–3. It focuses on topics like taking turns, resolving conflicts, and forming relationships. Includes eight 40-page full-color books: Be Careful and Stay Safe, Share and Take Turns, Join in and Play, Talk and Work It Out, Know and Follow Rules, When I Feel Afraid, Listen and Learn, and Cool Down. Printed books by Free Spirit Publishing, software by Attainment. Mini Mystery Readers present easy-to-read whodunits featuring detectives Sam Sherlock (reading level 2–3) and Bree Cody (reading level 3–4). Students must search the text for clues to solve the mystery. Includes 24 eight-page books with titles like The Case of the Mistaken Identity. Printed books by Remedia Publishing, software by Attainment. 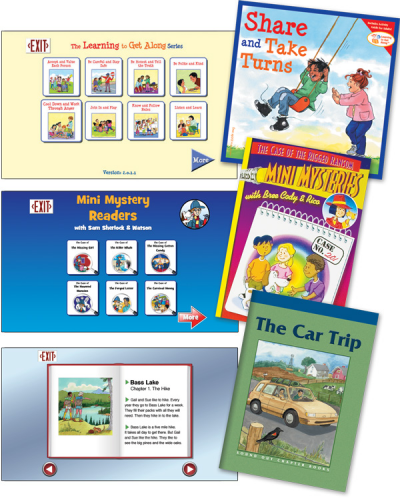 Sound Out Chapter Books provide readers, grades 3–8, with systematic opportunities to practice decoding one- and two-syllable words, while also learning valuable sight words. Includes 18 books, each with six chapters and 28 pages. Books are organized into six levels, with Level One focusing on one-syllable words with a short vowel, and Level Six on two-syllable words with prefixes and suffixes. Printed books by High Noon Books, software by Attainment. Programs and Series include the printed books and software. Software is compatible with Windows XP (SP2), Windows 7, Windows 8 and Macs with Intel processor OS 10.6 through 10.9. Performance is maximized on all Whiteboards, touch screens, and widescreen monitors. Scanning is automatic (one switch) and step (two switches). Disk-based software now includes a Three Computer License.